But, listening to Hollins' raw, candid interview with Peter Edmiston on Sports 56 Monday morning, I was most struck not by his blown-out-of-proportion comments about assistant Dave Joerger or even his passing mention of me, but by the personal aspect of it. When Hollins talks about his personal commitment to Memphis and about his now-deep family connections to the city, that's real. And on those grounds in particular it would be painful — for Hollins most of all, but for the city and its fans too — for his tenure here to end, a tenure, by the way, that is more profound over multiple assignments than perhaps any figure in franchise history. But it will be similarly bitter in the very possible event that Zach Randolph — who has said Memphis is now his home, regardless — wears a different uniform before he retires. Change happens. In most cases, though, teams can't make decisions based on those kinds of considerations. Jerry West took heat for dealing the beloved Shane Battier for Rudy Gay to kick off a rebuilding move coming off a playoff season. But he evaluated his team's present and settled on a future course and did what he thought was right. This Grizzlies team isn't interested in that kind of rebuild, but they are confronted with setting their own future course this summer. 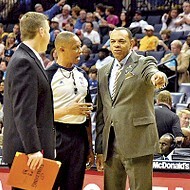 I think Hollins is, on the whole, a very good head coach. I think the risk of the unknown is significant. I also think this franchise needs to embrace a sturdier long-range philosophy than it had under Michael Heisley's more reactive stewardship and do think it's important for the head coach to have a positive, productive working relationship with the front office and ownership. And if, as seems likely despite reports of further talks between the two, Hollins and the team do part ways, knowing who to blame — if anyone — seems impossible. You can talk to anyone you want about meetings between the two sides and internal interactions, but everyone involved will filter that through their own perspectives. Without being in the middle of it, you can't truly have an informed opinion on it. The only thing that's clear is that Hollins is the employee in a scenario where “front office” and “ownership” are essentially one and the same. If it's determined that there can't be a productive working relationship going forward, there's only one possible outcome. And questions of right and wrong are ultimately unknowable and possibly irrelevant. Reading Comprehension: One thing reaction over the past day or so has underscored, sadly, is that not-that-subtle shifts in perspective are difficult for some to detect. Explaining why the team might do certain things is not the same as saying a team should do certain things. Most of my writing on this subject has been devoted to thinking through what might happen and why rather than proposing what should happen. Joerger, Hollins, and the Prospect of a Two-Year Deal: We're hearing now that the Grizzlies may yet offer Hollins a shorter-than-expected contract (say, two years) and it seems like Hollins' once potentially significant leverage may have diminished, with Milwaukee Bucks hiring Larry Drew and both the Los Angeles Clippers and Brooklyn Nets involved with other candidates beyond Hollins. Might Hollins actually return on a shorter deal? I've always thought that was the best scenario for all involved, but I wonder if too much damage has been done at this point for it to work. Would a two-year extension be workable if both sides feel forced into it? Is the relationship between Hollins and the team CEO Jason Levien salvageable given the events of the past few days? And, if so, can Hollins and lead assistant Dave Joerger still work together as effectively? It's unfortunate if also probably unavoidable that Joerger has become such a public part of this story. I've written about him in conjunction with the coaching question reluctantly, but not doing so would have been artificially ignoring a significant piece of the puzzle. By all indications, Joerger owes Hollins a tremendous debt and has made pains to stay out of the fray and focus on his job through all of this. There's a fondness that goes both ways despite Hollins' awkward and somewhat defensive radio comments about Joerger being widely misconstrued. They also share an agent, which is another odd twist in this ongoing story. Processes and Outcomes: The reaction I've heard over the past couple of days that's made me think the most was a morning radio riff yesterday about the new front office and their emphasis on process. I'm paraphrasing here, but it went something like this: You can have a nice process but all that matters is the outcome and that's what they have to be judged on — how much they win. That seems sound, right? It's almost a tautology: You succeed by winning. Except that I don't quite agree with it. And this brings it back to the Rorschach test idea I've suggested for both the Rudy Gay trade and the current coaching crisis. Reaction to both reveals, in part, how you think. The reason I think process is as worthy — maybe more worthy — of evaluation as outcome is because process is something you can control. Outcome is partly dependent on lots of factors outside of your control: The actions of others. Injuries. Lottery luck. The general randomness of the universe. Last season, the Grizzlies lost in the first round of the playoffs. This season they made it to the conference finals. Do these different outcomes suggest that Lionel Hollins became a better coach this season? Or is the difference heavily swayed by Zach Randolph's diminished capacity post-knee-injury last season and the absence of Russell Westbrook in the second round this season? I'd argue the process — Hollins' varying strengths and weaknesses as a coach — were largely the same, with the difference in outcome impacted by factors beyond his control. I value process. This was the source of most of my criticisms of Michael Heisley's ownership, even as it weaved its way back into on-court success. Selling off draft picks that could net cost-effective contributors is bad policy, whether you win 50 games the following season or 30. Paying well-above-market contracts and seemingly not factoring in long-range payroll projections in decision-making creates foreseeable problems down the road. Reactive, short-term thinking that doesn't make use of all available information in trying to answer questions or solve problems is itself a problem. Part of why I'm hopeful about this new regime — while still trying to develop a feel for them — is that I'm convinced they'll be comprehensive and deliberate in their thinking. This doesn't mean that they'll always make the right decisions — I questioned parting with a first-round pick in the Cavs deal and not getting sufficient three-point shooting back in the Gay deal — but I'm more convinced they'll have thought through all the angles and made smart use of all the relevant information. And I think that matters. Outcomes are part crapshoot and context-dependent. Process you can control. Good and Bad Reasons to Want Hollins Back: Seen a lot of different arguments on this front.